The India Habitat Centre in Delhi hosts many screenings of films, but rarely have I seen its Gulmohar Hall as packed as on 2 March 2019, for the documentary Ho Gayi Hai Pir Parvat Si (The Mountains Agonized). The fact that there was standing room only, and those people stayed standing until the end of the 111-minute film, is one indication of the distress that the people of Himachal Pradesh in India find themselves in. Another, of course, is the voices of the people that the documentary features. Throughout the film, huge earth moving machinery loom in the background, moving earth, dumping waste (illegally) down steep river slopes, and in the last scene, trundling along the middle of a dug up road as local schoolgirls try and dodge them. The sense of dread, and power, they evoke is hard to miss. None of the developers of these projects, though, feature in the film. Replying to indiaclimatedialogue.net on why they were not part of the film, Sahu said, “my understanding (is) that the narrative of the state on current development model is all over the mainstream media and middle class consciousness. The film rather tried to focus on the people’s narrative that is grossly missing everywhere.” The narrative of the companies and government officials, “that is something that everybody knows”. One of the ways that the film engages with the official narrative is by its interviews of other officials, such as Ranjit Singh Negi, a retired member of the prestigious Indian Administrative Service, and now president of Him Lok Jagriti Manch (Mountain People’s Vigilance Group). As a former bureaucrat, he is well versed in the legal obligations that have been flouted. For example, he explains that the No Objection Certificates (NOCs), which are prerequisite for the building of hydropower projects, were often ignored. For the 1,000 MW Karcham Wangtoo project, on which work began in 2005, the NOCs were only acquired from three out of 12 villages. In protest, people from Kinnaur refused to register for the panchayat (local village elected bodies that have the power to give NOCs) elections in 2011, leaving them empty. This does not reverse the damage done, of course, but it illustrates clearly that these projects are being undertaken against the law, and against the wishes of the people that live there. Many of them complain of their livelihoods being destroyed, as dust covers their almond and apple orchards, as blasting leaves their houses cracked and dangerous, and landslides destroy their lands and roads. Maybe most pernicious is the promise of electricity, for which these projects are being constructed. R.S. 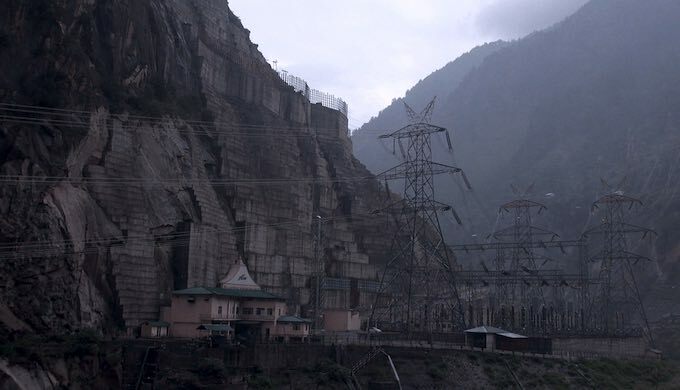 Negi states that the whole demand for the region of Kinnaur is 5 MW, but the projects already constructed and in the pipeline are for 3,000 MW. Meanwhile, a local tailor comments that the electricity in his village is gone for six hours in a day. The people of Kinnaur suffer all the loss, but little of the benefits are shared with them. Sahu makes excellent use of Google Maps imagery in the film, tracking the Sutlej River as it emerges from Tibet, where it is called Langqên Zangbo (Elephant river), enters India, and flows out into Pakistan as part of the Indus River, until it meets the sea. This is one of the three eastern rivers, which India has full share of under the Indus Waters Treaty. It is also one of the most exploited. According to construction plans cited in the film, 93% of the river in Himachal Pradesh will be relegated to tunnels and reservoirs. The film shows how deceptive the idea of run-of-the-river hydropower is. In many cases, the river is diverted through tunnels (in one case, a tunnel underneath the river itself!) that are kilometres in length. These tunnels use the power of the steep gradient created to generate power, but they also leave the river entirely dry for many kilometres. As a consequence, the local communities see their springs die out, landslides consume the geography as the lack of water destroys vegetation that held the soil together, and they become sitting ducks for one natural disaster or another – all of them exacerbated by these interventions. Himanshu Thakkar, co-ordinator of the South Asia Network on Dams, Rivers & People and interviewed in the documentary, said that Environmental Impact Assessments (EIAs) were project-based, but no cumulative impact assessment had been undertaken. Given the scale of the interventions, they had demanded this, and finally one was done, but somewhat secretly. A draft report of this was released in 2013. The film shows a clip from the public hearing on the report where the locals voice their concerns. One of them says he has little faith in the report, as he has never seen the people who conducted the report before. Another echoes the charge, and says he is an elected Pradhan (head of the village council, the locally elected body) and finds it implausible that 50% of the people of the region had been consulted as claimed, when they were completely unaware of the work. Another participant asks about there being no section on fish ladders; he gently chides the experts that fish don’t have wings to fly over their projects. Thakkar adds another few comments, namely that the people conducting the cumulative impact assessment are the same ones that did the EIAs, and there is an obvious conflict of interest. He further adds that the report contained a section that had suggestions, but it was not clear whether they had any legal standing. One of the last people to be interviewed is Shantakumar Negi, president of the Hangrang Valley Sangharsh Samiti (Hangrang Valley Struggle Committee). A young man, he was barely out of college when he got involved in asking the developers to cease their work. Other locals were unsure. “How can we fight the big people?” Fear of police cases, of violence and even killings, hung over them. Shantakumar Negi persisted, and when the developers said that their lives would be transformed, he told them he had seen lives transformed, but not for the better. His is one of the stories of successful resistance. Throughout the film, local people voice their frustration as people who are ignored, who have been allowed no say, whose objections are stifled while their lands, lives and livelihoods are destroyed. They speak, as apparently free people in an independent country, of having to fight for their freedom that the law supposedly allows them, but is not given them. Sounding a grim note, senior journalist Bisheshar Negi from Rampur fears how things are going. People have been pushed to the brink, with no recourse, he fears the turn towards violence – violence that many locals have already faced, but which they have not reciprocated – might be inevitable if things continue as they are.